Kevin Kurz: The Montreal Canadiens and New York Rangers have been scouting the San Jose Sharks regularly of late. George Richards: Scouts listed to attend last night’s Panthers-Capitals game: Vegas Golden Knights (2), New Jersey Devils, New York Rangers, Philadelphia Flyers, Pittsburgh Penguins, and the Toronto Maple Leafs. 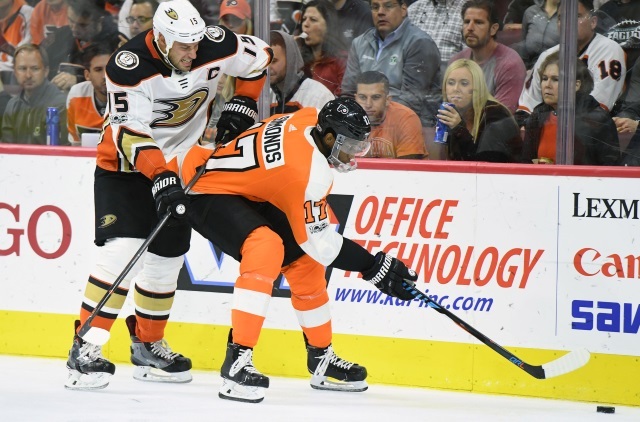 Adam Kimelman: Philadelphia Flyers GM Chuck Fletcher on pending UFA Wayne Simmonds. “Two weeks is a lifetime before the trade deadline. We’ll continue to see. We’re working at it every day. I guess when something happens we’ll be a position to let you know. Wayne’s played hard, he’s played very well of late. Emily Sadler of Sportsnet: The Anaheim Ducks have only two regulation wins in the past 25 games, 2-15-4 in their past 21 games, and are riding a seven-game losing streak. Helene Elliott tweets that Ducks GM Bob Murray hasn’t wanted to fire Carlyle, but they need show something to the fans that this isn’t acceptable. Johnston adds that they may have to make the move now.